7 photographs : col. ; 10 x 15 cm. 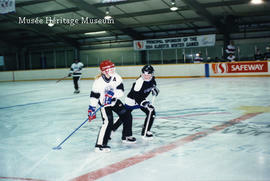 This file consists of photographs from the ringette event at the 1994 Alberta Winter Games in St. Albert. Photographs depict the ringette games in the Kinex Areana and the medal-winning teams. Photographs were taken by Bob Johnston.